While no comedian from Birmingham has managed to equal Frank Skinner's profile, the city is nonetheless home to some great comedy talent. Quite easily the city's biggest and brightest comedy hope since Uncle Frank Skinner busted out in the '90s. Hailing from Hall Green, Lycett's friendly, warm, but still cheeky delivery has already seen him make the jump onto TV with regular panel show appearances (8 Out Of 10 Cats, Buzzcocks etc). He's also supported acts such as Jack Whitehall live and made his solo UK headline tour last year with You Lycett You Should've Put A Ring On It, which was also part of the 2013 Birmingham Comedy Festival. 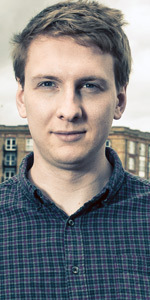 Hailing from Solihull (like the mighty Stewart Lee), Delaney has made his mark as a supreme gag writer for A-listers including Jason Manford and Micky Flanagan, and has easily slid from backroom writer on such TV shows as 8 Out of 10 Cats, Mock The Week, and Russell Howard's Good News, to panel guest. You want quick-fire jokes? Here's yer man! A true craftsman. Arguably best known as a sitcom actress, Jo's CV features such fare as Ideal (2005), Chris Addison's Lab Rats (2008), Trollied (2011) Ricky Gervais and Stephen Merchant's Life's Too Short (2011-12), and ITV's Job Centre centred The Job Lot (2013). She's also worked alongside Steve Coogan and Peter Kay. But behind the TV career is years spent on the stand-up circuit, and she can still be seen performing in local clubs. She also hosts her own monthly Rough Works nights at The Glee Club, where rising acts test out their new material. JAMES COOK - former local radio presenter, James is also an experienced stand-up comedian (and member of comedy troupe The Lovely Men) and has tutored many a would-be stand-up star thanks to his regular comedy courses at mac and other venues. ANDY ROBINSON - a contemporary of Jo Enright, Andy's Jo Brand's support act of choice. 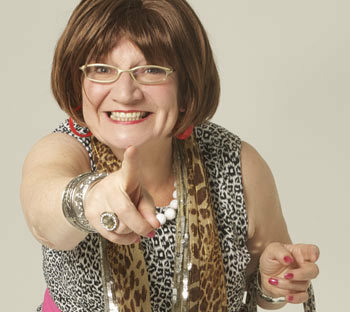 MRS BARBARA NICE - a cornerstone of the city's comedy scene for over a decade, Barbara is the creation of actress and theatre company boss Janice Connolly. Expect tales of West Mids buses, life as a mother in Kings Heath, and discount shops. Plus the odd game and occasional stage dive. SHAZIA MIRZA - thrust into the limelight after she faced abuse from (Asian) audience members not pleased at seeing an Asian woman on stage over a decade ago, Shazia's performed internationally, hosted documentaries, and written for national publications. But she still finds time to regularly return to her old home for stand-up appearances. And that's just scratching the surface of a rapidly expanding live scene. We could also mention critic and daily newspaper columnist Natalie Haynes or crime writer Mark Billingham - both local names who cut their teeth doing stand-up, but their careers have since taken them in other directions, and seem to rarely perform live. So instead, look out for Pakistan-born Indian comedian Mickey Sharma, Gareth Berliner (who is married to Aussie actress/ comedian Kiruna Stammell, from Life's Too Short), Craig Deeley, the Jack Dee-esque Freddie Farrell, Baggies fan and cougar Karen Bayley, Handsworth's Annette Fagon, and fast-paced Harriet Dyer. There's also the audience dividing Johnny 'Showaddywaddy' Sorrow, improv troupe Box Of Frogs and the University of Birmingham's Footnotes group.